If an organization is using both Pardot and Salesforce CRM, then they can leverage Pardot to pass marketing qualified lead (MQL) to Salesforce CRM. Connectors allow Pardot to pass the data back and forth between the applications – for example, between Pardot and (1) Salesforce CRM system; Pardot (2) and ReadyTalk; or Pardot (3) and Wistia respectively. In this article, I will cover the basics of Pardot and show you how it works with Salesforce CRM. Then, I will introduce you to Salesforce connector. Finally, I will throw some light on default sync behavior, what objects can be synced and, how to set up connector between Pardot and Salesforce CRM. Business Use case: – Donald Barnes is working as Marketing Automation Specialist at Universal Containers. They are planning to migrate to Pardot from other marketing automation tool. At Universal Containers they are using Salesforce CRM to better manage their customers. Donald Barnes doesn’t have experience with Pardot, so he wants to understand sync behavior between these two systems as well as Salesforce connector setup process. Currently, Pardot allows you to sync Leads, Contacts, Accounts, Opportunities, Campaigns, Email Activity and Custom objects (available as an add-on at Pro Edition and is included in Ultimate Edition) with Salesforce. Before syncing up a custom field – for example, Prospects custom field with Lead Custom field, make sure that it is mapped correctly. Is there a contact record in Salesforce with the same email address as a prospect record? If a contact record, with same email address, is found then, Pardot will sync with the prospect record with that contact record. If, on the other hand, a contact record, with the same email address is not found, then, Pardot will check to see if there is a lead record with the same email address. If a lead record, with the same email address, is found, then it will sync with that lead record. If no record is found with matching email address in Salesforce then, Pardot will go ahead and create a new lead in Salesforce. The following diagram represents the graphic view of Pardot to Salesforce sync. –> Pardot checks for changes in Salesforce, and within Pardot, every 2 minutes. If you are updating a large volume of data at a time, then, it may take longer for all of the changes to sync. –> You can also utilize the Automation Rule to sync prospects whose Salesforce lead or contact record was deleted. –> Remember that, to create a new record in Salesforce, the prospect must be assigned, manually, to a user in Pardot; unless, you are using Salesforce Active Assignment Rules to assign a prospect to a user in Pardot. 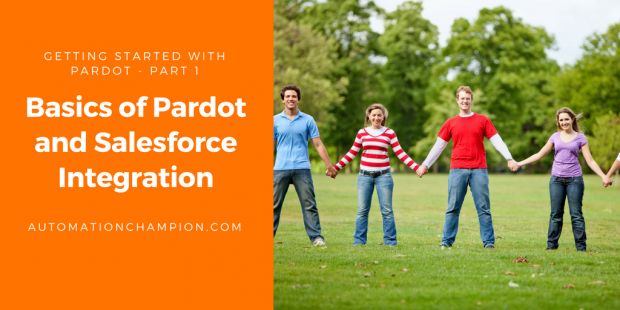 –> If there are duplicate contacts, or lead, with the same email address in Salesforce, Pardot will sync, at random, with any one of the Salesforce records. Manually: – Use Send to Pardot button on the lead or contact record to start the sync process. Import the lead or contact records with email address into Pardot. Under Salesforce Connector setup in Pardot enable, Automatically create prospects in Pardot if they are created as a Lead or Contact in Salesforce, option. Use Pardot API to integrate these two systems programmatically. The following diagram represents the graphic view of Salesforce to Pardot sync. –> If anytime someone updates the owner of a lead or a contact record, it will start the sync from Salesforce to Pardot. –> Any activity that updates the LastModified field, will trigger a sync to Pardot for existing prospects. –> You can only have one CRM connector at a time in Pardot. Has the standard object permissions listed on the following, screenshot for standard out-of-the-box sync behavior. The best practice – (i) before installing the Pardot AppExchange package to a Salesforce production org; and (ii) connecting it with a Pardot live instance – is to install the Pardot AppExchange package to a Salesforce sandbox and connect it with your Pardot training org. Then, test the integration with the small amount of data. Once you are done with integration testing, disconnect the connector setting. Then, install the Pardot AppExchange package to a Salesforce production org and connect it to your Pardot live instance. –> Pardot, does not have a limitation on user license. Instead, the restriction is on mailable prospects, File Storage or SEO Keyword Monitoring etc. The next step is to add Salesforce connector to your Pardot instance. In Pardot, navigate to Admin | Connectors | Add Connectors and select Salesforce. Select any of these options as per your business requirement to customize your Salesforce connector. Make sure to select Automatically create prospects in Pardot if they are created as a Lead or Contact in Salesforce checkbox. Check the Lead tab to see if this record is created in Salesforce. Likewise, if you create a lead record (with an email address) in Salesforce, it will automatically get created in Pardot. –> You can only have one CRM connector at a time in Pardot. If you have an existing CRM connector, you will need to delete it before you can add a different connector. The End: I look forward to your constructive suggestions and comments. Thank you! Hi Rakesh, i am not clear on the point under syncing behavior from Pardot to Salesforce – If no record is found with matching email address in Salesforce then, Pardot will go ahead and create a new lead in Salesforce. Why should a lead be created, will this not create an unnecessary volume of leads which are not leads in the real sense. Can these not stay as contacts in the system? Thanks for your comment. I think you missed a few paragraphs. Yes, it can create the contact, in such case you have to contact Pardot Support. Thanks a lot for this blog. This is an extremely insightful series on working with Pardot and my team and I here at Cymetrix have been keenly following it. Some of the guides have helped us gain fresh perspective on the ever evolving platform of Salesforce. Just wondering, are you planning to cover the topic of social media management with Pardot? If you are working for a Salesforce partner, then get in touch with Pardot support, to get the access of a Pardot training org. Good job! One thing I noticed…you pointed out that you must have a user assigned to a Prospect in order for it to sync. That user doesn’t have to be an actual person, it can also be a queue in Salesforce. I didn’t see you mention this, but I’m on my phone – it’s very tiny and I might have missed it! The point you explained is a fundamental concept in Pardot (Assigning a prospect to user/queue/group). I have mentioned it a few times on my blog.